Cook with Claire: Famous "Cakes"
Do you recognize this famous painting? It is one my all-time favorites. 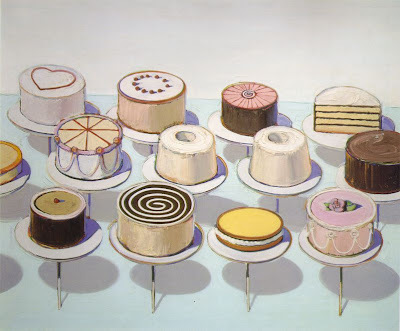 It's called "Cakes" by artist Wayne Thiebaud and is currently hanging on the walls of The National Gallery of Art in Washington, D.C.
Well... the girl scouts needed to earn their baking badge so I thought we would try to recreate this painting. 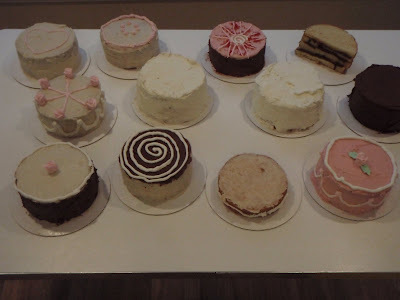 I used eight of my Heirloom Cakes, two orange sponge cakes, and one chocolate cake. We used the Chocolate Sour Cream Frosting and quite a bit of the Portsmouth Frosting. We also used whipped cream. I think the girls did a great job! Don't you? The girls did indeed do a FANTASTIC job!!! I am so impressed! This is amazing! Great job ladies!!! I love it so much I set the photo as my desktop background at here school. :))) Keep it up!